This Terrific 4 pound Gift Pack contains 2 pounds of our famous Nut Bark, 1 pound of roasted/salted Mixed Nuts and 1 pound of our Old Fashioned Creamery Chocolate Fudge. They are gift wrapped in red, a decorative bow is added along with your gift message and we ship it to your recipients via Postal Priority Mail! Send us your list of recipients and your gift message and we will take good care of your order! 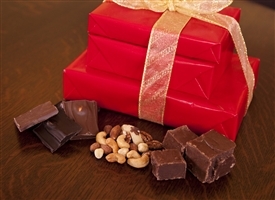 Please choose the type of chocolate for your Nut Bark selection from the drop down menu!